what is beauty? :To BUY (fashion) or to EAT? They say Beauty is in the eye on the beholder, but when it comes to fashion there seems to be a consensus! I’m sure everyone agrees that anything Mr. Largerfeld designs and produces is nothing but ‘beauty’, yet we judge the people who own such beauties. Are they beautiful because they wear Chanel? Are they beautiful because they earned it, through status and reputation? Are they beautiful because they fit the criteria? ; hair, face, make up and body size? Or are they beautiful because no matter the dress size, wealth, hair or skin colour , beauty is infinite? It is common knowledge what Karl Largerfeld thinks of body size and there place in the fashion industry. Having called Adele “fat”, stating how unacceptable it is for women to be overweight and claiming models are not that skinny, Chanel’s creative director expresses his view on beauty. 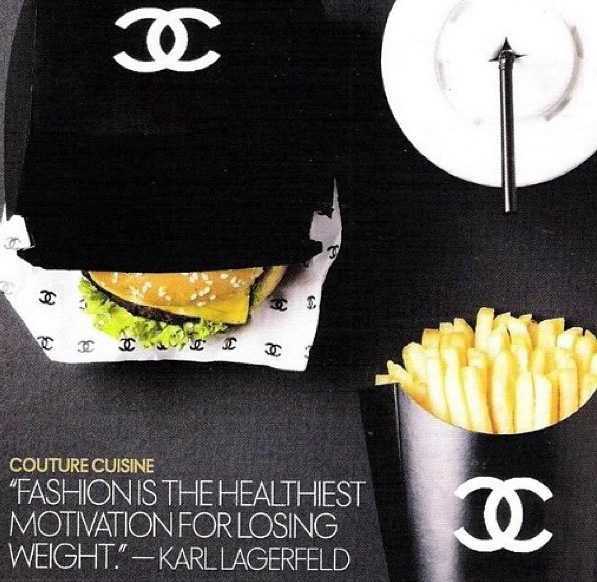 Chanel or a Big Mac? why not BOTH? why as women, are we obsessed with losing weight and trying to look the perfect part? Whilst fashion may be an inspiration,its society that fuel the drive to be “skinny”. But since when was skinny more beautiful than being curvy?